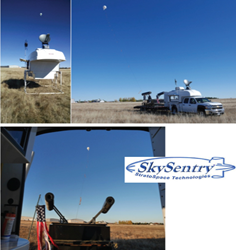 SkySentry, a Service-Disabled, Veteran-Owned Colorado firm, completed successful baseline performance testing of a self-contained ad hoc network covering a 300 square mile area, providing cell phone, text, geo location and video surveillance capability for disaster and emergency management applications. “We achieved the integration of a ground station with satellite link and Tactically Expedient Aerostat (TEATM) to enable video, internet, radio and cell phone capabilities into a mobile network which can be deployed with highly reliable and resilient performance in austere environments” said Charlie Lambert, SkySentry president. “We developed this capability in response to requirements of managers in public safety, austere location security, disaster recovery and firefighting. These customers expressed urgent need for communications in remote areas and after traditional infrastructure is destroyed or unavailable,” said Lambert. “We previously tested and deployed various segments of this solution. Today, we brought it all together to deploy a mobile, comprehensive communications network that can activate within two hours in a fully self-contained, mobile package. These are self-forming, self-healing networks, so a user can simply turn on the radio nodes and once the network is formed, the data will follow the most expedient path from transmitter to receiver without further user manipulation of the network” he added. In compliance with FAA regulations regarding moored balloons, the launch included a TEATM-18 (Tactically Expedient Aerostat -- 18 cubic foot volume) flying at 400 feet with a radio node enabling network range far beyond what could be achieved with towers. Characteristic performance included data throughput of 6.5 MBps at ranges in excess of 10 miles from the aerostat, 12 MBps over “daisy-chain” links in excess of 3 miles, and SATCOM connectivity of a minimum 15 MBps uplink and 5 MBps downlink with the network. The bandwidth supports emergency management Smartphone and tablet tools such as MapToTrack™ and other disaster management tools. RAJANT Corporation provided the mesh network implementation for the test, which included its intuitive BreadCrumb Commander software. This software makes administration of the network relatively easy to use, even for someone without a technical background. The aerostat was tethered to a SkySentry Tactically Expedient Aerostat (TEATM) Mooring Platform which contains all power, helium, and mechanical components. Durability of the solution was evident during fast moving storm fronts producing winds exceeding 35 knots, along with mountain wave and turbulence inducing hundreds of pounds of pull on the tether throughout the test flights. In all cases, the TEATM flew at its usual orientation of 45 degrees height above ground. A Carolina SATNET Ground Control Station (GCS) provided a solid operations center, climate-controlled shelter for the operators from the severe winds, workspace for three computer stations, and Satellite connectivity. The GCS is hosted on a standard pickup truck, which was also used to tow the TEA package to the flight location, providing an immediate, self-contained communications-surveillance austere site package.The launch and flights were conducted in collaboration with RAJANT Corporation and Carolina SATNET Solutions, LLC.